Dr Tony Hanks is a founder of co-operation between optometrists, for the benefit of patients in Australia and internationally. He was recognised for this with an award in the Queen's Birthday Honours of 2010. This was the "Medal of the Order of Australia" with the citation being "for significant commitment, dedication and meritorious service deemed worthy of particular recognition". 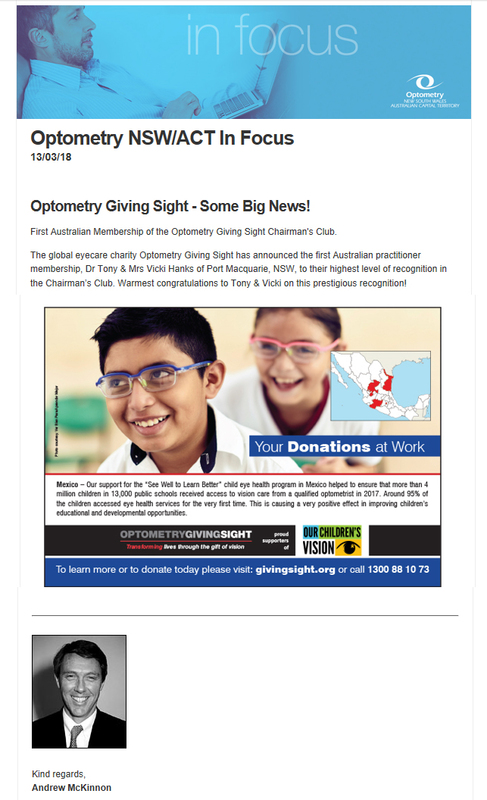 It was awarded by the Governor General of Australia for service to optometry and the community, as well as for his involvement in improving international eyecare and education. ​He has established and conducted successful optometry practices, and also worked on the research and development staff of Bausch & Lomb in Rochester and CIBA Vision in both Atlanta and Zurich. His fields of interest are specialty soft contact lenses, children's vision and professional practice development. In 2006 the Optometrists Association Australia recognised his outstanding contributions to the profession by awarding Tony Hanks the "Josef Lederer Award for Excellence in Optometry"; and in 2013 he was recognised with "Honorary Life Membership" of The Australian College of Optometry (ACO). ​Since 2007 he has supported the work of the charity Optometry Giving Sight (OGS), delivering improved eyecare in less developed regions of the world. In 2018 Tony & Vicki Hanks received the highest level of recognition from OGS as the first Australian practitioner members of "The Chairman's Club". Tony Hanks has had many articles and papers published internationally, as well as being a co-editor for some clinical optometry reference publications. His book for support staff - "The Optometry Team" - is now in its 4th edition and his book for optometrists - "What Patients Want" - is in its 1st edition. Eye Talk Consultants was sold to the Optical Distributors & Manufacturers Association (ODMA) in 2014. The practices of Hanks Optometrists were sold to George & Matilda Eyecare in 2016. Tony Hanks became an Emeritus Former Member of the Australian Optometric Panel (AOP) in 2016. He retired as a member and a Director of Eyecare Plus Ltd in 2016. He ceased practising in 2017 and is now registered only as a "non-practising optometrist".